One of the fascinating things about being on the Encinitas City Council is really understanding how things work. I feel this way about infrastructure issues, such as what happens to my children’s bathwater when I drain the tub, but also about operational issues. For example, labor negotiations. For many months, the city’s negotiators have been holding “meet and confers” with labor representatives, and this week we announced a deal. This process was all new to me, and I’m here to tell you that it’s very involved. There’s even a specific vocabulary. Possible compensation packages called “supposals” that aren’t as serious as “proposals” and can’t tie either side, go back and forth, and back and forth. We now have a four-year labor contract, which supposedly creates “labor peace.” We haven’t had a labor contract for the last three years, which means our employees’ compensation has been unchanged. Three years ago when labor negotiations broke down, we “imposed,” or made the employees accept, our “last and best” offer, which was essentially the status quo. The negotiating process starts with a comparison of the “salary bands” for other public employees in neighboring cities that have the same job. What do they make, and what kind of raises did they get recently? We didn’t do any comparing with similar-type jobs in the private sector. Base pay will go up 1% for 2015 and 2016, and then 2% for 2017 and 2018. We are also adding to the cafeteria plan, giving employees one additional “floating” holiday they can use whenever they want. The financial effect is that for 183 employees, the city will pay an additional $180,800 for the first year, and a total of about $1 million across four years. Employees who are represented by a union (113 employees) and those who aren’t (70 employees, many of them in management positions) in the city and the water district get the same deal. This doesn’t cover public safety employees, who have a completely different, already negotiated, contract. The deal is a relatively modest increase after three years of no increases, and it’s a reflection of the reality that our employees are already fairly compensated compared to neighboring cities — but it takes into account that the cost of living continues to increase. Here’s a San Diego Union-Tribune article on the new contract. This time-intensive negotiation was a learning experience for me, and I’m glad that we’ve got it settled for the next four years. 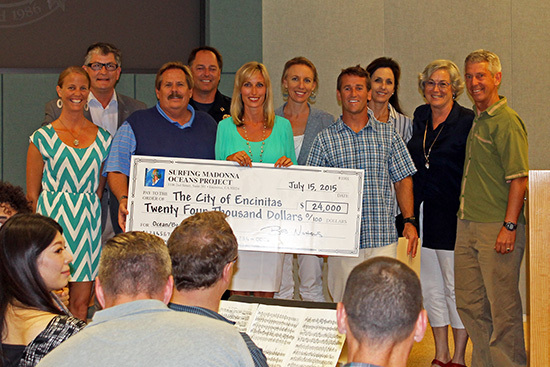 The City Council accepted a $24,000 check from the Surfing Madonna Oceans Project. We are lucky to have this outstanding organization in our community. This week the City Council unanimously voted to move forward with an ordinance that makes pre-plumbing for greywater systems mandatory in new construction. We also directed staff to get back to us with more details about lowering permit fees for greywater systems and incentivizing their installation through rebates. Greywater is gently used water from uses like bathing, washing clothes and hand washing. Why drain water into the sewer when you could water your plants with it? To be clear, the greywater systems we’re talking about don’t reuse water from kitchen sinks or toilets, because of potential health hazards. Retrofitting an existing house for greywater, particularly if it’s on a slab, is prohibitively expensive and therefore very rarely done. Pre-plumbing a house adds a small cost up front, but can result in financial and ecological benefits down the line, when (and if) the greywater system is installed. This is why it’s so important that we consider the amount of the permit fee. If the city charges hundreds of dollars to approve and inspect the system, it’s a disincentive to install it. I’m grateful for the quick actions of our city staff on the Council’s greywater request. When faced with the historic drought in April, I suggested that we implement code changes that would promote greywater systems to help homeowners easily re-use water on their own property. The Council unanimously agreed and we asked city staff to work on it. Three months later we have a new ordinance and a new streamlined approach. That responsiveness from our city staff deserves commendation! The more we can eliminate the middle man, i.e. the sewer system and treatment plant, and reuse water on residents’ property, the better. Here’s an Encinitas Advocate article about this. We also approved an ordinance that established an expedited, streamlined permitting process, with no city permitting fees, for small residential rooftop solar systems. This change was mandated by state law. To discourage those who are reportedly living in their cars downtown, and parking them overnight in two-hour parking spaces, we’ve requested parking tickets occasionally be written in the downtown. We directed staff to investigate the possibility of permit parking in residential areas at night, a valet service and/or the use of a City Hall parking lot as a designated waiting area to help ease the parking problems created by taxis, ride share services and party buses creating traffic and parking problems in the street. We directed city staff to proactively reach out to downtown businesses to expedite the “alley activation program” so the alleys are better lit and attractive, and to deter unwanted and illegal actives, like drug use. We’d like the city to do more to publicize the fact that positive change is happening now. Sheriff and code enforcement have a higher profile presence in downtown. We requested an assessment in the fall of the success of the program. The Encinitas City Council is now on a one-month recess. We’ll be back in the saddle in mid-August. I wish everyone a happy, healthy, fun-filled summer, enjoying this paradise we are lucky to call home.